Tomorrow morning early I’ll be off again, this time down to Manchester where I spent a lot of time, both at uni and for a couple of years working in a gallery there after I graduated. The show, the Great Northern Contemporary Craft Fair is taking place at Spinningfields which I believe is the same area as the old YHA shop that I worked in before it was bulldozed, it was a bit rough when I was there, cracks all over the walls, probably from the amount of times we were ram raided, it needed bulldozing. It’s a bit odd in a way being there as I haven’t actually been there with my pots since I left though I do have pots in the gallery I worked in, the Royal Exchange. Lisa Hooper spent the morning with me decorating her pot. 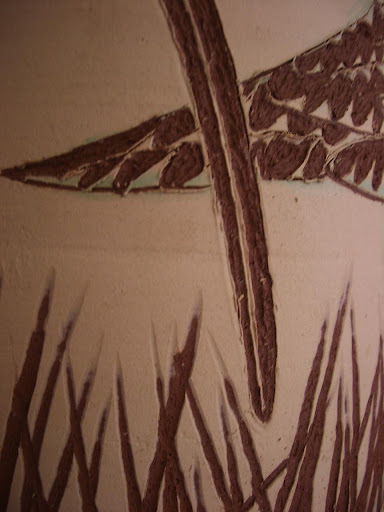 It’s lovely, she got quite into the sgraffito, as a print maker I think it had many echos for her. This is just a taster, I didn’t want to give too much away. Until the next time, have a good weekend and pop into the show if you are in Manchester and say hello. This entry was posted in Great Northern Contemporary Craft Fair, Lisa Hooper, sgraffito. Bookmark the permalink. Have a good show Hannah. We loved the card you sent!!! Hey, Hannah, That YHA shop..The manager wasn't John Hepworth by any chance? Dammit, it must have been, they were forever getting ram-raided, as was the one in Leeds, Berghaus Jackets was the favourite, I seem to recall. I remember, he said one day there were some chavs in the store, eyeing up every rack, and the suspicion came that this was a ram-party's advance visit, so that night all the berghauses were locked in the office and the racks swapped. sure enough, the rammies came, and grabbed everything on the racks where the good stuff had been.John's my cousin, by the way, and when I had the pottery, he used to come and help, mixing glaze, pugging clay, and making little slabbed planters.